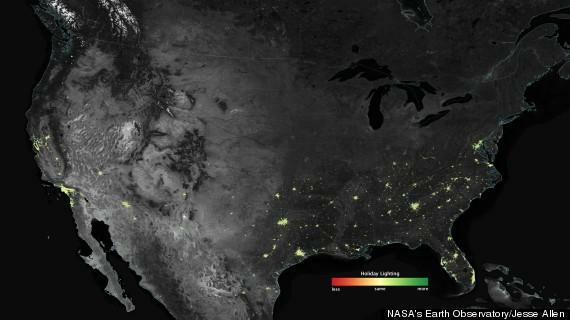 New photos created from NASA’s Suomi NPP satellite, shows the extent of holiday light displays in the U.S. compared to the rest of the year. By comparing the light from the Christmas holiday with the rest of the year, the differential is extracted and shown on the map. Scientists found that nighttime lights around major U.S. cities shone 20 percent to 50 percent brighter around Christmas. Dark green in the key is used to indicate areas where lights have the largest gain mostly suburbs being 50 percent brighter in December. The images released were taken between 2012 and 2013 and include 70 American cities. The difference is most pronounced in suburbs and small towns where residents have bigger yards and bigger homes. Lights were brightest between Thanksgiving and New Year’s Day. The Suomi NPP weather satellite, launched in 2011, has a sounder infrared spectrometer named Cross-track Infrared Sounder (CrIS), and a scanning radiometer named Visible Infrared Imaging Radiometer Suite (VIIRS). Since 1980, polar-orbiting weather satellites have included both imagers and sounders. These types of sensors record data continuously, using different wavelengths to infer information on a global scale. The CrIS sounder infrared spectrometer is an instrument measuring temperature and water vapor as a function of different heights within the atmosphere. The scanner collects multiple spectral data via 1,305 separated spectral channels (sensors), internally separating infrared energy into wavelengths, similar to a weather balloon. CrIS produces high-resolution, three-dimensional temperature, pressure, and moisture profiles. These profiles are used to enhance weather forecasting models, and they will facilitate both short- and long-term weather forecasting. The VIIRS uses radiometric and infrared imaging, thereby using a color pallet to ‘paint’ polarized heat images by assigning color to each heat temperature, which is the sole instrument used to create the above map. VIIRS collects visible and infrared imagery and radiometric measurements of the land, atmosphere, cryosphere, and oceans. VIIRS data is used to measure cloud and aerosol properties, ocean color, sea and land surface temperature, ice motion and temperature, fires, and Earth’s albedo. VIIRS can record infrared light even in the presence of clouds, moonlight and air particles. Together VIIRS and CrIS combine infrared instruments and can determine cloud top height and thermodynamic phase (ice or water particles), and make estimates of microphysical and optical properties that indicate the amount of water and ice in the cloud layer. The Suomi NPP satellite is the result of a partnership between NASA, the National Oceanic and Atmospheric Administration, and the Department of Defense.